Exceptional faculty members are the key to an outstanding Country School education. This year, 78 full-time teachers and 46 apprentices, assistants and part-time specialists support and inspire our students. Well over half of our full-time teachers hold master’s degrees. Our seasoned instructors reflect ethnic and religious diversity, as well as a blend of youth and maturity. These teachers—an eclectic group of lifelong learners who lead by example—challenge students to fulfill their potential, find their path, and follow their passions whether in the classroom, on the playing fields, on the stage, or serving the community. With a teacher-to-student ratio of 1 to 6 and supported by a dedicated corps of 52 administrators and staff members that strongly believe in the power of education, our innovative and caring faculty guides our students to become change agents of the future. Country School teachers have, on average, taught for 18 years and continually work to expand and hone their skills. New Canaan Country School endeavors to recruit and retain outstanding scholars and teachers and recognizes their achievements in a variety of ways. New Canaan Country School celebrated excellence in teaching by naming three faculty chairs at the school’s Annual Meeting & Dinner on Sept. 13. 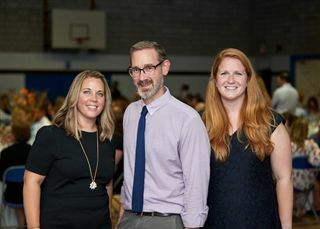 Middle School Spanish teacher Abby Cali, Kindergarten teacher Darby Webber and Upper School science teacher Scott Lilley were presented the awards by Head of School Aaron Cooper in front of a large gathering of parents, faculty and staff members. Awarded every two years, faculty chairs have been endowed by three former Country School families: the Holmes Family, the Laverack Family, and the Williams Family. The chairs recognize exceptional full-time faculty who demonstrate a commitment to engaging and inspiring students, creating curriculum to reach all learners, and seeking ongoing professional development. They also provide financial support for growth in academic research, teaching or service. Prior to joining New Canaan Country School in July 2018, Aaron Cooper was Head of Elisabeth Morrow School in Englewood, N.J. for six years. During his 15 years at EMS, Aaron has also served as Assistant Head, Dean of Students, and he has coached and taught math, Latin and public speaking, and led middle school advisory groups in addition to overseeing the secondary school placement process. Previously, Aaron worked at the Peck School (NJ), Germantown Friends School (PA), and with the A Better Chance (NY) organization. Aaron earned an Ed.M. in Private School Leadership and an M.A. in Educational Leadership from Teachers College, Columbia University; he received his B.A. in the Growth and Structure of Cities from Haverford College, and a diploma from Groton School. He served on the board of The Community Chest of Englewood, has served on five re-accreditation visiting committees and is a member of the Elementary School Heads Association. Aaron and his wife, Kara, have two daughters, Julia and Charlotte. Brooke Arthur joined New Canaan Country School as Director of Marketing and Communications in 2012. She holds a master’s degree in media and communication arts from Pace University and a bachelor’s degree in English from Fairfield University. Previously, she was the Assistant Dean of Communications for Pace University’s Dyson College of Arts and Sciences in New York City, and before that served as Director of Media Relations and Marketing for Stamford Museum and Nature Center. She started her career as a journalist and has written and edited for numerous local and regional newspapers and magazines including the New Canaan Advertiser, Greenwich Post, Stamford Advocate, Greenwich Time, Stamford Magazine, Ridgefield Magazine and Bedford Magazine, among others. She has two children, Michaela '24 and Desmond. Terry Gumz joined Country School as Director of Advancement in July 2012. Terry is a seasoned veteran in her field, having spent more than 20 years leading the development or advancement efforts at Chapin and Hewitt Schools in New York City, Brunswick School in Greenwich, Connecticut and San Francisco Day School in San Francisco, Calif..
Terry holds a bachelor’s degree from Trinity College in Hartford, Conn. and is a graduate of the Gill School (now Gill-St. Bernard’s) in Bernardsville, N.J.. Terry has successfully raised a total of more than $100 million in capital campaigns for facilities and endowment at Chapin, Brunswick, and San Francisco Day School, as well as having overseen annual funds, communications, website development and alumni affairs. Terry is currently an ex-officio member of the Board of Directors of Horizons at New Canaan Country School and has served as an ex-officio trustee of Breakthrough San Francisco, a year-round academic enrichment program of San Francisco Day School “for children with limited educational opportunities.” Terry has two grown children, Lily and Charlie, and in her spare time enjoys yoga, travel, reading and friends. Meaghan Mallin became the Head of Lower School in 2016. Previously, Meaghan spent 14 years at The Stanwich School in Greenwich, CT, most recently as Associate Head of School for Grades PreK-12 and Head of Lower School, for Grades PreK through 6. Though she has served as a school administrator for the past 11 years, Meaghan’s background also includes classroom experience ranging in age from early childhood through Grade 4 at both Stanwich and Brunswick School. She earned her B.S. in Accounting from Boston College Carroll School of Management and her M.A. in Teaching from Manhattanville College. Meaghan and her husband, Zack, have two children. Her son, Connor, is a first grader at Country School and she has a two-year-old daughter named Rose. Prior to joining Country School in July 2018, Bob was Executive Director of the Philadelphia Area Independent School Business Officer Association Health Benefit Trust for two years. PAISBOA is an organization of area independent schools he helped start in 1991. In the last five years, Bob transitioned its $96 million health plan to self-funded status and saved 130 member schools $15 million in the first year. Prior to PAISBOA-HBT, Bob was CFO at Delaware Valley Friends School in Pennsylvania for 25 years where he oversaw all finance and operations. During his time at DVFS, hewas also a board member - including vice president - and active participant in the National Business Officers’ Association (NBOA), a group involving CFOs from more than 1,400 independent schools nationally. He was also a faculty member at the National Association of Independent Schools’ (NAIS) Summer Institute for Finance Administration. Beth O’Brien began her educational career at New Canaan Country School as an apprentice teacher in the Lower School from 1992-1994. She worked as an elementary teacher in the Seattle, Wash. area teaching in a first, second and third grade multi-age classroom, and then returned to Country School in 2000 as a Beginners Assistant. From 2002-2008, she served as the Beginners Program Coordinator and as a Lead Teacher in the Beginners Program. Pursuing an interest in literacy and language development, she studied and worked at the Windward School in White Plains in 2008-2009. Beth returned to Country School in 2010 to serve as our Associate Director of Admission and in 2012, became the Head of Early Childhood. Beth has a B.A. from Bucknell University, an Elementary Certification from Center for Montessori Education and has done graduate work at Bank Street College. Currently she is participating in the Leadership Institute at Teachers College, Columbia University. Kisha was the Director of Women as Global Leaders at the Forest Ridge School of the Sacred Heart in Bellevue, WA for eight years. She holds a Masters of Public Administration from the University of Washington Evans School of Public Policy and a B.A. from Vassar College. Kirsten Rosolen has been Head of Middle School since 2005. She started her teaching career at Country School as a Grade 5 apprentice and then became a Grade 5 homeroom teacher. An alumna of Choate Rosemary Hall, she returned there for many summers to teach and work as the Director for the CONNECT Math and Science Program for Middle School Girls. Kirsten earned a B.A. in Biology from Bucknell University and an M.A. in Teaching, with a focus on Middle School Education and Administration, from Sacred Heart University. In addition, she was a fellow in Vanderbilt’s Peabody Professional Institute for Independent School Leadership. Recently, she presented on Mission Skills at the annual National Association of Independent Schools and co-authored the article, “Building Character: How Can Independent Schools Ensure They Teach What They Profess?” Kirsten has also served on the Board’s Advancement Committee and Master Planning Committees. Kirsten is active in the Connecticut Association of Independent Schools (CAIS) and the Fairchester Middle School Heads groups and was a member of a school accreditation team. She enjoys playing pickle ball and cooking. Kirsten and her husband, Matt, have two children. Pam Safford joined Country School in 2016. She has extensive experience in admission work, having most recently served as the Dean of Admission and Financial Aid at Deerfield Academy. Prior to that she was the Associate Head for Communications, Enrollment and Planning at Concord Academy for 13 years. She held previous roles in admission at Northfield Mount Hermon School in Northfield, MA and Shattuck-St. Mary’s School in Faribault, MN. She holds a Master of Science degree in School Leadership from University of Pennsylvania and a B.A. of Sociology and Anthropology from Carleton College. She is a founding trustee and former chair of the Board for the Association of Independent School Admission Professionals (AISAP), as well as a former board member at The Ethel Walker School, her alma mater. Committed to supporting professional development among her peers, Pam has presented at various national conferences including IECA, NAIS, SSATB and TABS. Alex Wellman became Head of Upper School in July 2017. Previously, he was the Assistant Director of College Guidance and Sophomore Class Academic Dean at Greens Farms Academy in Westport, CT, where he has worked since 2008. Alex has held several other positions there over the years: Freshman Class Dean, Upper School Admission Associate and English teacher. Prior to his work at GFA, Alex taught English and Spanish for one year at Kimball Union Academy. Alex holds an M.A. in English Literature and a B.A. in English and Spanish Literature from Middlebury College. In addition to working in independent schools since graduating college, Alex is also a product of them, having attended both Greenwich Country Day and – following his family’s move to Charlotte, NC – Providence Day School. When Alex isn’t on campus, odds are you can find him cooking, reading, writing, or running.